Make easy gel wax candle. 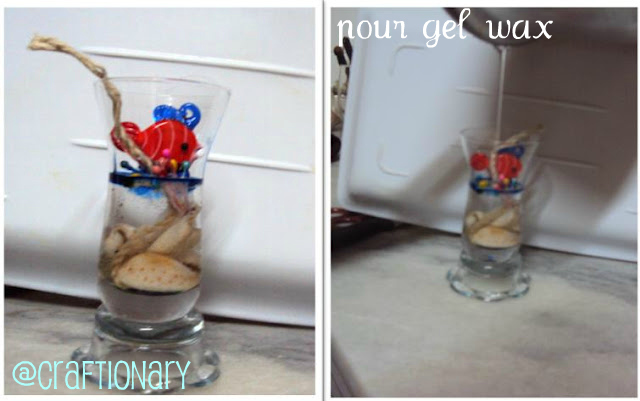 A DIY tutorial to help you make gel candles. I come from a family of creative ladies. 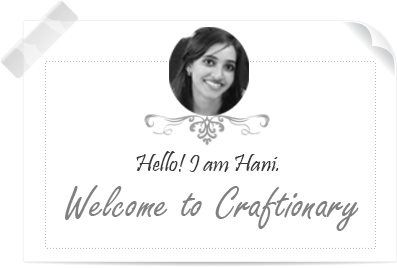 Who love to craft, decorate and simply create. While I was away from writing about my crafty adventures, I learned to make candles with my cousin. And this cute little thing is my first ever candle. 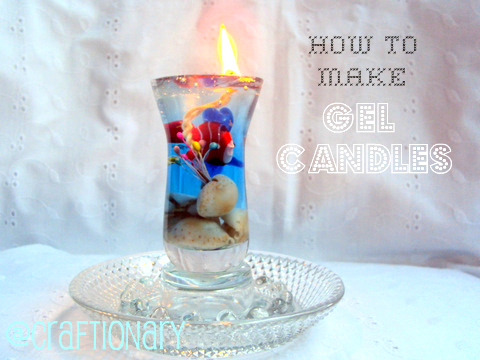 Gel candles are one of the simplest DIY projects to make. I also have a name for this cute DIY candle. Not only do they look amazing but you will have real fun making gel candles. Start by placing the candle wick at the base of the glass. (It’s always better to roll the wick around a pencil. 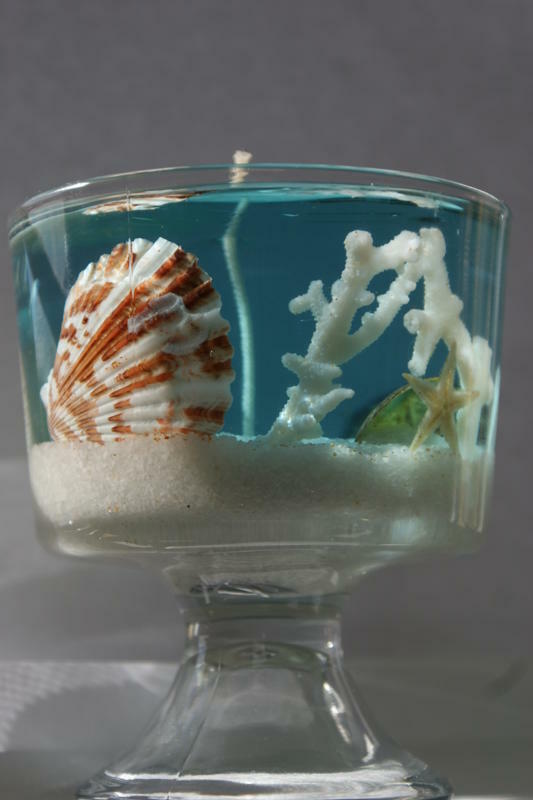 Fill the glass jar with sea shells. You can also use glass beads, marbles, stones or anything your heart desires. Here I have tucked-in a few colorful stamens into a sea shell. They resemble the look of corals in the sea to me! Now take a small amount of gel wax in a pan. And warm it on a VERY low flame, otherwise it can burn. Slowly pour the gel into the glass jar, making sure you don’t move the glass jar. Stability helps reduce the formation of bubbles. You can move it once the gel sets completely. Here I stopped pouring gel wax to try another fun technique. I stopped at half and added drops of blue food color. The blue ring gives a beautiful ocean feel to the candle. I added only two drops and you can see how it looks. You can mix the color in the pan, when warming the gel to make colored wax. You can quickly add food color drops in the glass jar. While the gel wax is still in the liquid form it will form beautiful swirls. And you can also wait for a few seconds (let’s say 15-20 seconds) and then put drops of color. The semi-solid gel wax will not allow the color to penetrate much and make a ring of color. 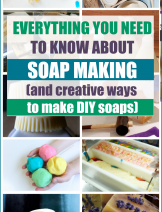 Think about all the wonderful possibilities using this technique! 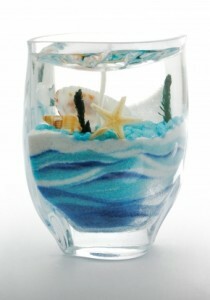 Once again I wanted my fish to be floating above the sea shells. So I waited for the halfway gel wax to cool down and settle. It cools down fast so a few minutes is good enough. Place your fish and pour the gel wax again following the same warm and pour method. Colorful from the top. Wow! And easy as a pie, your done! Will you make easy gel wax candle now? I hope you enjoyed the gel candle tutorial. Do you have burned out candles at home? Check out this tutorial on how to recycle candles that don’t burn anymore. Beautiful wedding gift made with sea shells upside down. Make this candle with a floor made by pouring layers of colorful sand. How about a floor of crushed glass and algae? You can also use salt to make this candle’s base. And also glue salt on tiny twigs to make algae. 25 DIY Decorative Candle Tutorials. 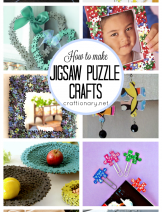 Looking for fun craft ideas? 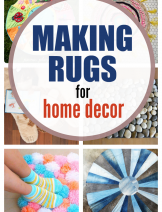 Check out tutorials in the categories Handmade Flowers and Wall Art. You will also enjoy the DIY Candles Board. Beautiful! I love gel candles and had no idea how to make them. They're on my project list now! THanks for sharing. Saw you over at While He Was Napping! Kala asked me where did I buy gel wax? I want to answer the question here, just in case someone else is curious too.. You can easily find gel wax in any craft store, it's very common craft material. You can look for good deals on it at amazon and eBay. Or go look for it at michaels, hobby lobby, joann and other craft stores. It's available everywhere. Hi.this is very pretty candle and would love to make. I want to ask can we make this gel candle at home? Yes you can! I made them at home too. Just be careful during the heating and pouring of gel as it involves heat and make sure your surface is porous. How fun!! 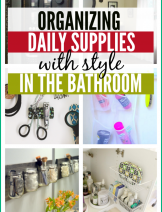 🙂 Thanks for linking up at Giggles, Glitz & Glam. Wow – this is a great tutorial. Thanks for sharing how to do this!! Thanks for linking up to Take it on Tuesday blog hop! I was wondering if you can put something in these wax candles to make them have a nice scent. Absolutely beautiful! I've never even thought of making gel candles. I love your finished product AND I get to play with fire. Win. Win. Thanks so much for taking part in our Pin'Inspiration Party. Hope that you are having as much fun exploring as I am and that you'll take part in helping the “Beat the Winter Blues” on Saturday. that is an awesome idea for a party favor! 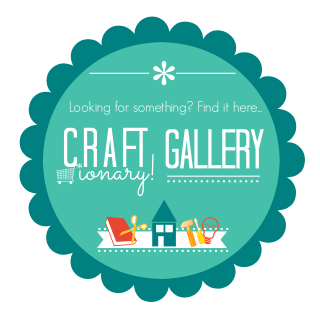 Thanks for sharing and linking up at Create & Inspire! Too fun! I heart the beach! Would you consider sharing here? Too Cute!! I love it! I'm your newest follower….Thanks so much for linking up!! What a COOL idea! You are a creative genius 🙂 Thanks for sharing at oopsey daisy! 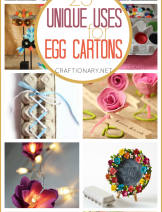 I've never thought about making these myself, but what a fun idea! Yours turned out super cute. This is such a awesome idea! PS: I am your newest Linky Follower. How much fun is this?? We love this! We have a link party going on as well. Would you link up with us too? You could be featured next week! How cool is that? I love candles! 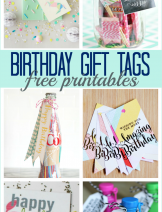 I am hosting my first link party today and would love for you to link this up, along with anything else you like! How fun!! And you could do all kinds of different themes. 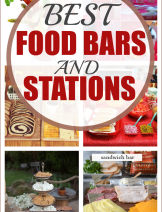 I'd love for you to share this at my link party that runs through Sat. 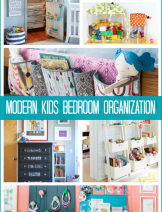 What a fun idea – I love that you can put fun items in the gel – so cute! I am visiting from TT&J and would love it if you'd visit back! Wow! I've never tried to make one of these, but I might have to now with your fabulous tutorial! They'd be a great summer decor item for sure. Pretty candles! These are really cool! Visiting from Serendipity and Spice Manic Monday. These are awesome! Such a fun tutorial! These are awesome! 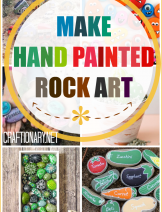 Thank you for stopping by and posting them in my Kid's Crafts Linky party 🙂 I think kids would really love making these, what a great afternoon project. This is such a fun project. I will have to try it one day. 🙂 Found you through the Linky party by the way. I love the idea of being able to choose what little doodads to include in the gel! So pretty and fun!!! 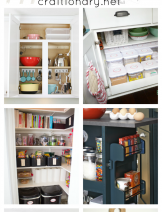 Thanks for sharing this on Fancy This Fridays this last week! Very cute! Love all the different versions! So creative! Thanks for sharing at my place! Please come back again tomorrow and share another if you can! Hi, I want to make gel candles but the embeds need to be glass or metal only (non-flammable only). I saw someone who was selling online and she had put a tea light at the top of the gel candle to avoid the wick burning down to the embeds. do you have any idea how she suspended the tea light at the top of the candle? You can't just put it in the gel as it is hardening (like you did to put yours closer to the top) because as the tea light gets hot it will melt the gel and it will sink into the candle. No? It's hard to find embeds that arent' flammable. Also 7 lbs of gel is $49 at Michaels and online you can get it cheaper but you have to buy an enormous amount of it. Any ideas to get it cheaper? Would appreciate any help. You can put the tea light on the top by first filling your container till where you want the tea light to float, then when it's hard place your tea light and fill gel around the tea light and let it harden. I think the tea light will sink in the gel candles but I'm not sure because I have never tried it! I am going to ask my Facebook readers just in case someone has any idea about it sinking, embeds and cheaper gel! I think you can find a good deal on bulk sale of gel at amazon and eBay but candle art has always been expensive. This is amazing. Looks so much better than normal candle wax as well! Great work! Its beautiful . but I HV a query that food color should be liquid ?? Powdered food color vl nt work ??? Plzzz do reply . I really need your help. You can use both. If you have powdered food colors, liquefy them before pulling them into the gel. Hope that helps! I am glad that I found this site because I had no idea what it was that I needed to make colored gel with. Hi , can u plz tel me do we need to paste the wick at the bottom or hold the wick and directly poure the melted gel wax . This is a fantastic idea. I am certain;y going to have to try this. Thank you so very much. What colour was your gel in solid form, if it was transparent and you heat it in a clear stainless steel pan on low it should stay clear. Let me know! im just starting to do candles I am wondering if an idea will work my idea is to pour my wax (blue) then clear (gel ) and then another level (red) in the clear I found a few wax American flags that I was going to put in there I know I need to let each level harden completely but will the gell be too soft still or what can I use to make a seethrough center layer? Hi, gel will turn into a jelly-like form. I haven’t tried it but I think it should work. Good luck! Do share your results with us!